Hive is the secret behind the blistering pace at Uber, Starbucks, Samsung, WeWork, Pinterest and thousands of other businesses. It provides a real-time platform for driving your company’s work forwards. Every team should have a simple way to track who is working on what, and leaders should have a clear, real-time view of progress. 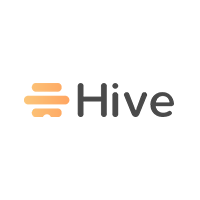 Hive integrates with over 1,000 popular tools, like Slack, Google Apps, Salesforce, Mailchimp and WordPress. It also supports integrations for files from Box, Google Drive and Dropbox.